Can't access your Device Server through the serial port? COM mode is selected by choosing "Device Servers attached to the COM ports" from the access mode drop-down box, located at the top of the DS Manager's main window. In the COM access mode the DS is accessed through its serial port. Therefore, you must connect the serial port of the DS to the unused COM of your PC using a DS-to-PC cable (like WAS-1455 supplied by Tibbo). 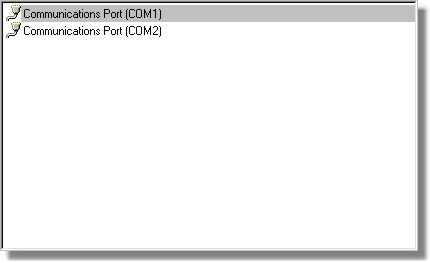 In the COM access mode the device list displays all physical COM ports of your PC. The DS Manager is not able to determine which COM the DS is connected to so you have to make a correct selection by yourself. For the DS Manager to access the DS the latter must be in the serial programming mode. To put the DS into this mode press the setup button*. Status LEDs of the DS are playing a serial programming mode pattern (shown on the left) when the serial port of the DS is in the serial programming mode (click hereto see all available patterns). * On EM100, EM120, EM200, EM203(A)- pull the MD line LOW for at least 100ms.